Wang, X., Wu, Y., Chen, H., Zhou, X., Zhang, Z., and Xu, W. (2019). "Effect of surface carbonization on mechanical properties of LVL," BioRes. 14(1), 453-463. The wood veneer from Monopetalanthus species was heated under different temperatures (120 °C, 160 °C, 200 °C, and 240 °C) and then laminated as the surface of laminated veneer lumber (LVL). Bending modulus of elasticity (MOE), modulus of rupture (MOR), and impact toughness (IT) of the LVL were tested. The results showed that the failure location became scattered as the surface veneer carbonization temperature was increased and that the failure mode changed from split failure in the control and the 120 °C samples to crack failure in the 160 °C, 200 °C, and 240 °C samples under the bending load. Fiber tearing was visible in all five sample types, where the length of the tearing fibers became shorter with increased surface heating temperature under impact load. 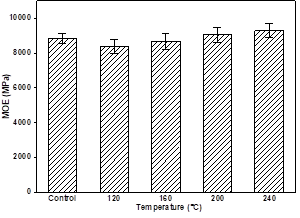 The carbonization temperature of surface veneer had a minimal effect on the MOE but a considerable effect on the MOR and IT, and the MOR mainly showed a downtrend. The IT loss decreased as the surface veneer carbonization temperature was increased. Laminated veneer lumber (LVL) is composed of parallel arranged veneers that can be produced by medium or small diameter logs. LVL has advantages of high utilization, strength, bendability, and is available in various large dimensions (Yusufziya et al. 2009; Bal 2014; Gilbert et al. 2017). It is a useful product for structural purposes and is widely used in building and traffic tools such as bridges, beams, columns, and furniture (Ozarska 1999; Davies and Fragiacomo 2011; Yeoh et al. 2011). Although it has many good qualities, there are still drawbacks in using LVL products. Due to wood’s biological characteristics, such as being easily degraded, damaged by worms, and split in dry-wet alternate conditions (Sici 1996), there is motivation to impregnate LVL with preservatives (Shukla and Kamdem 2012) and fire retardant agents (Candan et al. 2014). Also, it can be finish coated (Morrell and Love 2015). As it is mainly made from fast-growth poplar or other low quality wood, LVL often needs to be strengthened by resin impregnation to achieve higher mechanical properties or a harder surface (Wang et al. 2011; Wang et al. 2012), which often brings environmental issues for the LVL products. Treating methods, such as chemical impregnation and furnish coatings, are basically universal for both wood and wooden panels, including LVL (Kjellow and Henriksen 2009; Jiang et al. 2015). As a possible alternative, thermal treatments, with no use of any chemical agent, have been regarded as an effective and relatively environmentally friendly method (Gérardin 2016) for wood modification: it has been found to significantly reduce decay, insects, and shape deformation of wood, through the composition changes under high temperature (Sandor et al. 2009; Juodeikien 2013; Si̇Vri̇Kaya et al. 2015). However, there is a drawback: strength loss resulting from chemical decomposition have been observed following high temperature treatment (Mburu et al. 2008; Korkut and Hiziroglu 2009). In some kinds of laminated composite plates, such as sandwich panels, different materials could be chosen at each interface according to specific applications and environmental loadings. In an effort to explain the complicated performance caused by compounded structure, deformation theories have been developed for laminated composite plates (Chikh et al. 2017). To simplify the prediction model, a lot of work was done to reduce degrees of freedom in the calculation model (Draiche et al. 2016). 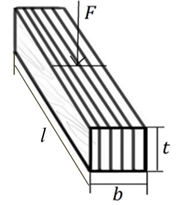 The model was shown to be accurate in solving the static bending response of laminated composite plates for isotropic composite problems (Mahi et al. 2015). As for the wooden laminated composite panel, performance would be much more complex due to its anisotropy. Considering the multi-layer structure of LVL, the authors proposed a hypothesis that better properties might be obtained through the mixed structure of LVL with carbonized veneers and untreated ones. The surface layer, which had the issue that could be solved by thermal treatment, such as decay and splitting, could be replaced by thermal treated veneers, to restrain decay and splitting; the other layers can consist of untreated veneers to maintain strength. Thermal treatment is often companied with decreases of mechanical properties (Gunduz et al. 2009), and the components of wood (cellulose, hemicellulose, and lignin) have different levels of performance when treated with temperature changes (Wang et al. 2015; Bolade 2017). For these reasons, it is important to determine how mechanical properties of LVL with carbonized-untreated mixed veneers are affected by differences in carbonization temperature. In this research, the surfaces of a five-layer LVL were replaced by the carbonized veneers, and untreated veneers were used for the rest of the structure. Mechanical properties, specifically the modulus of elasticity, modulus of rupture, and impact toughness of the mixed-LVL were studied at different temperatures of surface carbonation. Monopetalanthus sp., a wood piece widely used for furniture manufacture, supplied by Yihua Wood Company Limited., Shantou, China, was used. The LVL consisted of five Monopetalanthus sp. sliced veneers; two surface layers were heated and the other three layers were not heat-treated. The LVL with surface layer which was unheated and heated at 120 °C, 160 °C, 200 °C, and 240 °C were defined as type I, II, III, IV, and V (Fig. 1), respectively. The vacuum oven, HJ-ZK45, produced by Dongguan hengjun instrument equipment co. LTD, was used for heating of the veneers. The Monopetalanthus sp. veneers with a thickness of 5.5 mm were heated under vacuum conditions with pressure lower than 0.04 MPa for 2 h at the above setting temperatures. During vacuum heating, the temperature reached 90 °C and was then maintained for at least 20 min to avoid possible veneer distortion caused by water evaporation. After heating, all veneers were planed to 4.5 mm. The emulsion polymer isocyanate (EPI), PU-209A/B, provided by Guangzhou GBS high-tech & industry Co., Ltd, China, was used to glue veneers together to form the five-layer panel under a pressure of 1 MPa, which was maintained for 1 h. All veneers were arranged along a parallel grain. The LVLs with average thickness of 20.6 mm (CV=7%) were then sanded into 20 mm. Three mechanical properties—modulus of elasticity (MOE), modulus of rupture (MOR), and impact toughness (IT)—were measured in this study, using samples with the dimensions 300 mm × 20 mm × 20 mm (l × b × t). Fifteen pieces were prepared for each property. The MOE and MOR along the t direction were considered and measured by a three-point bending load method according to the Chinese standard GB/T 17657 (2013), loading vertically along the t direction (Fig. 2). Mechanical testing machine, AG-2000A, produced by Shimadzu company, was used for MOE, MOR testing, and impact testing machine, JBS-300, produced by Jinan Hensgrand Instrument and Equipment Co. LTD, was used for impact testing. 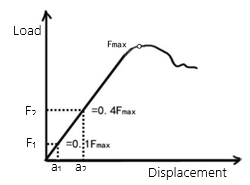 where l is the span length (mm), b and t are the width (mm) and thickness (mm), respectively, of the specimen, F1, and F2 are the load (N) when 10% and 40%, respectively, of the maximum load was reached, a1, and a2 are the displacements (mm) corresponding to F1 and F2 in the load-displacement curve, and Fmax is the maximum load (N). where Q is the energy absorbed by the specimen (J), and b and t are the width and thickness (mm), respectively, of the specimen. The failure modes of LVL under bending load with face-layer carbonized, types Ⅰ, Ⅱ, Ⅲ, Ⅳ, and Ⅴ, are given in Fig. 5. Different from the loading along the r direction (Ugovšek et al. 2013; Song et al. 2017), there was no evident bond line tearing when loading along the t direction. The failure location was mainly concentrated under the loading point in Sample Ⅰ, Sample Ⅱ, and Sample Ⅲ, and became spread out in the other two samples. Different failure modes were seen in the different samples, and different layers in one sample. Split failure occurred in the untreated layers, and the crack failure occurred in the carbonization layers in Sample Ⅲ, Sample Ⅳ, and Sample Ⅴ, in which the face veneers were heated under 160 °C, 200 °C, and 240 °C, respectively. However, the opposite phenomenon appeared in Sample Ⅱ, in which the face veneer was treated under 120 °C. Co-crack failure was evidently found between the carbonization face, the adjacent layers in Sample Ⅳ, and Sample Ⅴ, and the inner adjacent three layers in Sample Ⅱ. The failure modes of LVL with surface layer carbonization at different temperatures under impact load are given in Fig. 6. Fiber tearing was seen in all five samples, which showed a characteristic of ductile failure. As the face veneer carbonization temperature increased, the length of the tearing fibers and destruction region along the l direction became shorter. The integrity of fiber failure was seen in all five samples without stratification caused by different layers, except for a crack failure in the face veneer of Sample Ⅱ. The failure mode was not changed as the temperatures increased; for example, crack failures were seen in the surface layers of the samples that were heated at 120 °C, and 240 °C, and not in the others. The elasticity of heat-treated wood might increase because of additional lignin cross-linking near the glass transition temperature (Villani et al. 2017), which could be the reason why a crack failure was not found in Sample Ⅲ or Sample Ⅳ. The carbonized surface layers had a complicated effect on the LVL, which was not homogeneously made. The failure mode changed into a brittle failure from the ductile burst as the carbonization temperature increased (Lexuan et al. 2007). The carbonization temperature of the surface layer had an influence on the failure mode of not only the carbonized surface layers, but also the other three inner veneers, and the LVL as a whole. The failure mode of the LVL, whose structure mixed carbon and non-carbon veneers, with smaller temperature change range should be studied further to know the specific effect; an increase in carbonization temperature in the surface layer did not necessarily result in cracking from splitting failure, in the temperature range from 120 °C to 240 °C. Figure 7 shows the MOE values of LVL, in which the temperature of face veneer treatment changed under bending load. The MOE of the LVL changed little when the surface veneers were heated under different temperatures. Values of MOE first decreased and then increased slightly with a change ratio of -5.2%, -2.2%, 2.2%, and 4.9% when the surface layer of LVL was heated at 120 °C, 160 °C, 200 °C, 240 °C respectively. The MOE showed a different tendency than plywood, which was decreased by as much as 22% when heated at 180 °C compared with an untreated specimen (Aro et al. 2014). A positive influence was also found in Eucalyptus pellita wood when heating from 80 °C to 200 °C under vacuum conditions, which showed a 25.2% increase at 200 °C than the control (Wang et al. 2014). The MOR of the LVLs when the face veneer treatment temperature changed under bending load are given in Fig. 8. The MOR values of the panels in which the surface layers were heated were lower than those of the unheated ones, which decreased 24%, 11.9%, 37.9%, and 47.8% under 120 °C, 160 °C, 200 °C, and 240 °C, respectively. 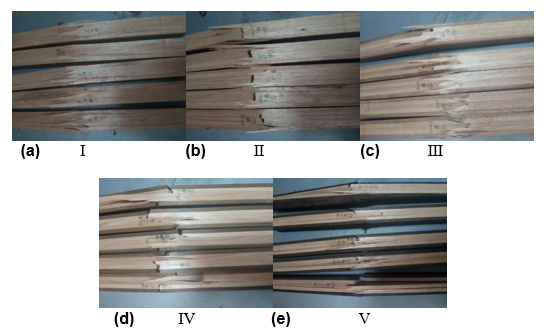 These results were lower than the 54% decrease for plywood with all four layers treated at 180 °C (Aro et al. 2014). Different from radiata pine, which is a type of softwood (Boonstra et al. 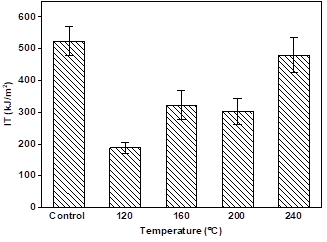 2007), a gradual reduction of the MOR was not seen as the surface carbonization temperature increased. This might have been explained by the complexity of the components of Monopetalanthus spp wood, a tropical type of hardwood. The chemical changes in this hardwood were more complicated with a change in temperature than those in the softwood (Deng et al. 2009; Iveta et al. 2016). 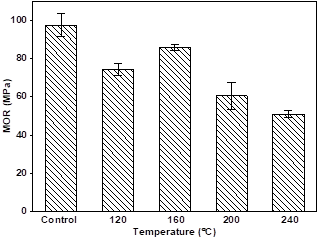 Figure 9 shows the IT values of LVL affected by the face veneer treatment temperature changes under bending load. The IT of the panels with the carbonized surfaces were all lower than those of the control, which decreased 64%, 38.3%, 42.2%, and 8.4% as the surface layer of LVL was heated at 120 °C, 160 °C, 200 °C, and 240 °C, respectively. Different from solid Douglas fir and alder wood, of which the IT values decreased with increased heating temperature (Borůvka et al. 2015), the IT loss of the LVL was mainly alleviated with the increase in surface heating temperature from 120 °C to 240 °C. This decrease was possibly due to a complex chemical change under different temperatures in wood (Hughes et al. 2015), and a synergistic effect of the mixed panel structure with both heated and unheated veneers in the LVL (Yu and Fan 2017). As the surface veneer heating temperature increased, the MOE, MOR, and IT of LVL showed different tendencies: there was either none or a slight positive effect on the MOE, and a decline in the MOR and IT. For all three mechanical properties, they did not show a good performance when the surface layer was treated at 120 °C, while it was relatively better at 240 °C for MOE and IT, which was rather inconsistent, and as expected from other research (Kol 2010). The mechanical properties of LVL with both carbon and non-carbon veneers were different from those of neither all unheated nor all heated LVL, and they may also be affected by the thickness, quantity, location, etc., of the carbonization veneer in LVL. Further research into how carbonization affects the LVL performance should be conducted to obtain the ideal LVL structure for specific requirements, according to its application. For example, there would be different requirements when it is used in building or for furniture. 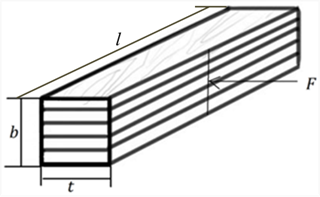 The surface layer of LVL in a five-layer structure was substituted by a carbonized veneer heated at different temperatures, and the failure mode and mechanical properties of the LVL under bending load was studied. 1. The failure of five-layer LVLs mainly involved the entirety of the structure, including all five samples without stratification caused by different layers under bending load. 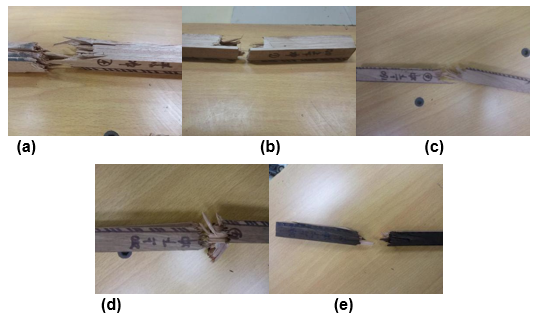 Splitting failure and cracking failure were seen in different samples, whereas the tendency from splitting to cracking failure were not seen as the surface heating temperature increased under impact load. 2. The influence of the surface carbonization temperature on the MOE, MOR, and IT showed different tendencies, with either none or a slight positive effect on the MOE, and a decline in the MOR and IT. A decrease was not necessarily the result of a change in surface carbonization temperature. The MOE, MOR, and IT did not show a strong performance when the surface layer was treated at 120 °C, but the MOE and IT did show a relatively better performance at 240 °C. The authors are grateful for the support of The National Key Research and Development Program of China, Grant No. 2016YFD0600702. Bolade, M. O. (2017). “Chemical structure and glass transition temperature of Ricinodendron Heudelotii wood for its pulp production potential,” International Journal of Scientific and Technology Research 6(2), 291-295. Sici, Y. (1996). Wood Science, China Forestry Press, Beijing, China. Wang, X. H., Fei, B. H., and Liu, J. L. (2014). “Effect of vacuum heat treatment temperature on physical and mechanical properties of Eucalyptus pellita wood,” Wood and Fiber Science 46(3), 368-375. Article submitted: May 20, 2018; Peer review completed: July 21, 2018; Revised version received and accepted; August 8, 2018; Published: November 26, 2018.